Each year, pneumonia and other lower respiratory infections kill nearly 1 million children — more than malaria and HIV combined. Some of those deaths could be avoided if every child on Earth had access to advanced healthcare, but that’s not the case. In fact, more than 95 percent of people in the developing world lack access to the X-ray imaging technology that’s ideal for pneumonia diagnosis. Researchers from Johns Hopkins University may have a solution to this problem: a “smart stethoscope” that uses artificial intelligence to diagnose pneumonia on its own. A standard stethoscope is a low-cost, highly valuable tool for detecting lung disorders. Unfortunately, its value is lost if the person wielding it doesn’t know what to listen for or if ambient noise masks the sound of a patient’s breathing. With those limitations in mind, the Johns Hopkins team set out to reimagine the stethoscope. They designed a device capable of capturing the sound of the lungs while filtering out outside noise, and then they created an AI-powered app that “listens” to the lung sound for signs of pneumonia. 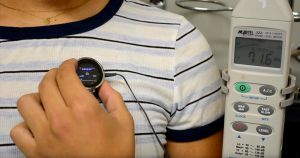 The Johns Hopkins team is currently field testing prototypes of its smart stethoscope in Peru, Bangladesh, Malawi, and the U.S., and it has high hopes for the future of the final version of the device, which it expects to be “significantly cheaper” than the $500 electronic stethoscopes currently on the market. “By enabling on-the-spot screenings with a cheap device that can be handled by local health workers, we hope our reengineered scope will make a difference in the global health crisis of childhood pneumonia,” the researchers wrote. More on AI healthcare: Your Future Doctor May Not Be Human. This Is the Rise of AI in Medicine.